I’m running the Boulder Distance Classic Saturday morning. This is not something I had planned until a week or two ago. I couldn’t resist the affordable registration fee. It’s an unusual distance at 15K – or 9.3 miles. I’ll leverage the event and crowd to make it a speed workout. I might use the first mile to warm up and then see how long I can hold a 7 minute pace. Maybe a 7:10 pace. That’s probably more realistic as a speed I can maintain. Shoot, a 7:20 pace would be an improvement and anything under 7:45 will be a decent speed workout. So it’s settled then, a 7:30 pace. Some of my Prospect neighbors will be running. Jabe’s Running Group will be there. I think I’m most excited that the course isn’t over the same old back roads of every other Boulder Res event. Rather, it’s mostly trail and loops back around Coot Lake and the irrigation canal on the north side of the Res. I haven’t run that trail since I had my Texas dogs, Teddy and Tara. I miss running with those dogs; they used to keep me in shape. Whatever pace I’m able to hold, I should try to maintain it for at least 6 miles. That will make for an excellent Bolder Boulder training run. I need to get out this week though to log some miles. Never-ending night time calls to Japan and the rest of AP are getting in the way of my evening routine. Work needs to settle down. Or I need to start running around 3 in the afternoon. That might be the answer. Running must be prioritized with everything else if I’m going to meet any of my goals this summer. Good Lord, I have a marathon in 6 weeks. All this focus lately on speed; I can’t forget distance. I need more time in the day. While I’m whining, it wouldn’t hurt if it could stop snowing and warm up a bit. Weather willing, I think I might follow up Saturday’s 15K with a 15 miler Sunday. I do that, then I’m scheduling a massage with Shannon too. I did get in 7 miles today. Couldn’t run a speed workout on the LoBo Trail though. The snow was mostly melted and because of that it was wet. It was like slogging through a muddy river bottom. Averaged an 8:19 pace and held that fairly steady. My first two miles were both 8:14.4. Exact to the tenth of a second. That’s an official race photo above. 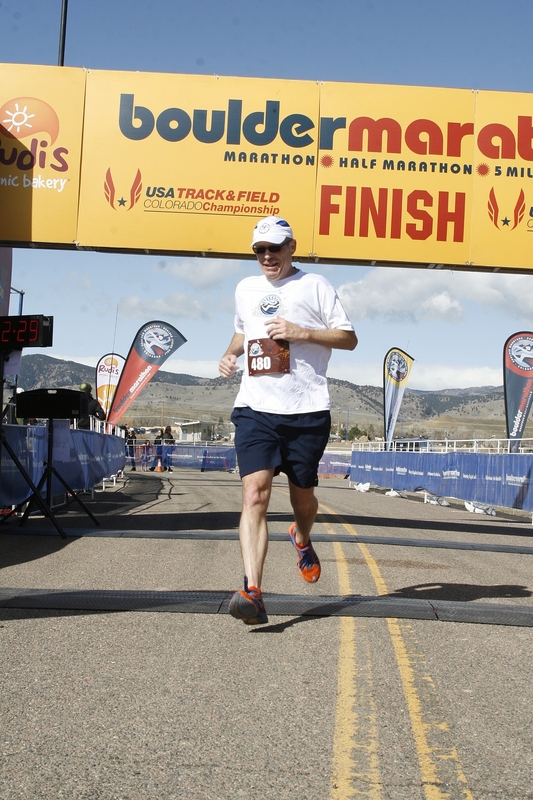 For anyone who ran the Boulder Half, the race pics are available at prints4sale.com. Photographer Jason Powers caught two pics of me airborne. I love that.